Beginning of April was marked by a great event organized flawlessly by our EUROPEA-Espana friends and colleagues. AGROLYMPICS-Murcia gathered 17 teams from all over Spain for a wonderful competition held at the premises of Palacio de Ferias y Exposiciones IFEPA just opposite the agricultural training centre CIFEA de Torre Pacheco in the village of Torre Pacheco, Murcia. 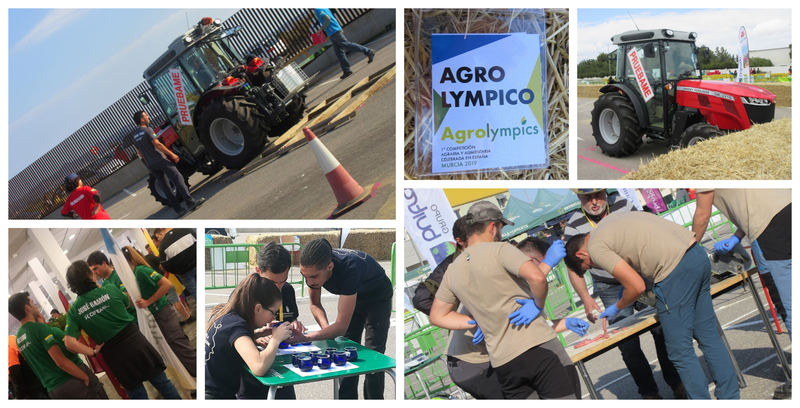 During the two-day contest Spanish students of agricultural training showcased their professional knowledge and skills in 20 different tasks in order to get one lucky winner, a team that would represent Spain in this year’s AGROLYMPICS-Poland in May/June 2019. Tasks included some traditional ones: tractor driving or reversing a trailer for example,; as well as those requiring very special Spanish competences such as olive oil tasting or the funny and amusing olive seeds spitting. Lucky winners, who fought really hard for this title, were students of the home school CIFEA de Torre Pacheco. Centro de Formación del Medio Rural de Moraleja, Cáceres, Extremadura came second while CIFEA Lorca, Lorca, Murcia landed in the bronze medal position. Congratulations to the winners 🙂 and also to the organisers for the great atmosphere and a wonderful event. Mucho animo, agrolympicos 🙂 and see you in Poland! For more details visit the great AGROLYMPICS-Murcia website. Acknowledgements: Many-many thanks to the organisers for inviting and hosting the EUROPEA Editorial Group!